Ship: Fortune, 1621 Life in England: John Winslow grew up in Droitwich, Worcestershire with his parents, Edward and Magdalene (Oliver/Ollyver) Winslow, one stepbrother, four brothers and two sisters. His father was a salt extractor. ​Life in New England: Mary Chilton came to Plymouth with her parents on the Mayflower in 1620. Her parents died the first winter, and another family most likely raised her. John Winslow came over in 1621. He was a freeman of Plymouth in 1633, and served 1652–1654 as a deputy to the general court. They moved to Boston in 1655 where he was a merchant. Both of them left very detailed wills. 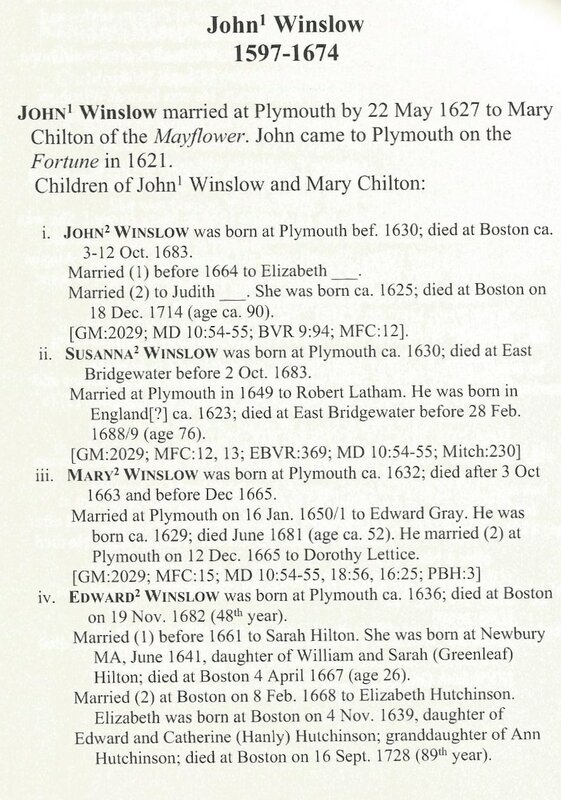 Family: John Winslow married Mary Chilton between 1623 and May 22,1627, in Plymouth and had ten children. She died between July 31, 1676, and May 1, 1679, in Boston. *Mary was born about 1632. She married Edward Gray on January 16, 1650/1, in Plymouth and had six children. She died after October 28, 1663, and before November 1665 in Plymouth. He died in June 1681 in Plymouth. *Isaac was born about 1643. He married Mary Nowell on August 14, 1666, and had two children. He died at Port Royal, Jamaica in August 1670. She died before January 23, 1729, in Charlestown. *Benjamin was born on August 12, 1653, in Plymouth. He died between March 12, 1673/4, and July 31, 1676, unmarried." For Further Information: Robert C. Anderson. The Great Migration Begins. Boston: New England Historic Genealogical Society, 1995. Robert C. Anderson. The Pilgrim Migration. Boston: New England Historic Genealogical Society, 2004. Kenneth W.Kirkpatrick.“The ‘Loving Cosens’:Herbert Pelham, Sir Arthur Hesilrige, and Gov. 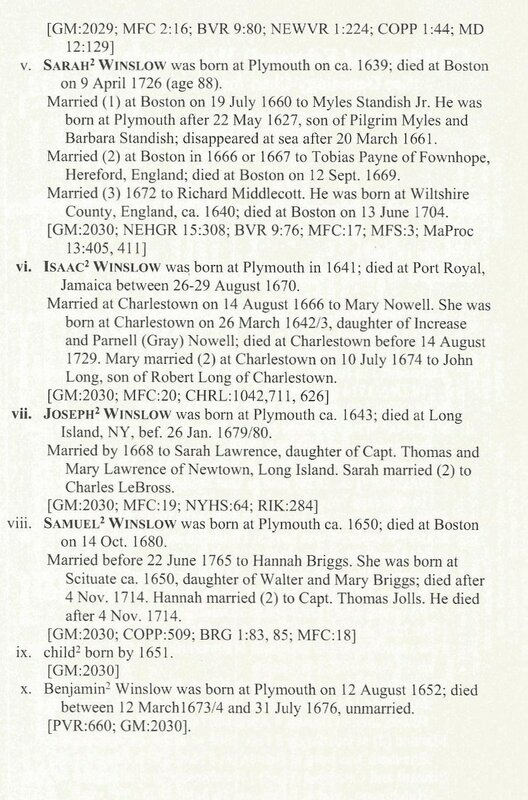 Edward1 Winslow.” New England Historical and Genealogical Register 154: 78–108. 2000. 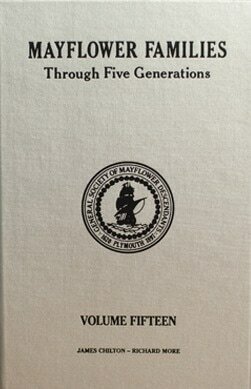 Mayflower Families through Five Generations:Vol. 15: James Chilton. Robert M. Sherman, Robert S.Wakefield, and Lydia D. Finlay, compilers. Plymouth: General Society of Mayflower Descendants, 1997. Eugene A. Stratton. Plymouth Colony: Its History and People, 1620–1691. Salt Lake City:Ancestry Publishing, 1986.